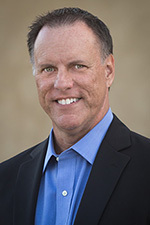 Update | Richard M. Hicks Consulting, Inc.
A longstanding issue with Windows 10 Always On VPN is that of VPN tunnel connectivity reliability and device tunnel/user tunnel interoperability. Many administrators have reported that Always On VPN connections fail to establish automatically at times, that only one tunnel comes up at a time (user tunnel or device tunnel, but not both), or that VPN tunnels fail to establish when coming out of sleep or hibernate modes. Have a look at the comments on this post and you’ll get a good understanding of the issues with Always On VPN. The good news is that most of these issues have been resolved with recent updates to Windows 10 1803 and 1809. Specifically, the February 19, 2019 update for Windows 10 1803 (KB4487029) and the March 1, 2019 update for Windows 10 1809 (KB4482887) include fixes to address these known issues. Administrators are encouraged to deploy Windows 10 1803 with the latest updates applied when implementing Always On VPN. Windows 10 1809 with the latest updates applied is preferred though. Although initial reports are favorable for these updates and based on my experience the effectiveness and reliability of Windows 10 Always On VPN is greatly improved, there have still been some reports of intermittent VPN tunnel establishment failures. During my testing, after applying the updates referenced earlier both device tunnel and user tunnel connections are established much more consistently than before the updates were applied. I did encounter some issues, however. Specifically, when coming out of sleep or hibernate, VPN connections would fail to establish. Occasionally VPN connections would fail after a complete restart. After further investigation it was determined that the connectivity failure was caused by the Network Connectivity Status Indicator (NCSI) probe failing, causing Windows to report “No Internet access”. In this instance the NCSI probe failure was caused by the Cisco Umbrella Roaming Client installed and running on the device. The Umbrella Roaming Client is security software that provides client protection by monitoring and filtering DNS queries. It operates by configuring a DNS listener on the loopback address. NCSI probes are known to fail when the DNS server is running on a different interface than is being tested. Microsoft released a fix for this issue in Windows 10 1709. The fix involves changing a group policy setting to disable interface binding when perform DNS lookups by the NCSI. 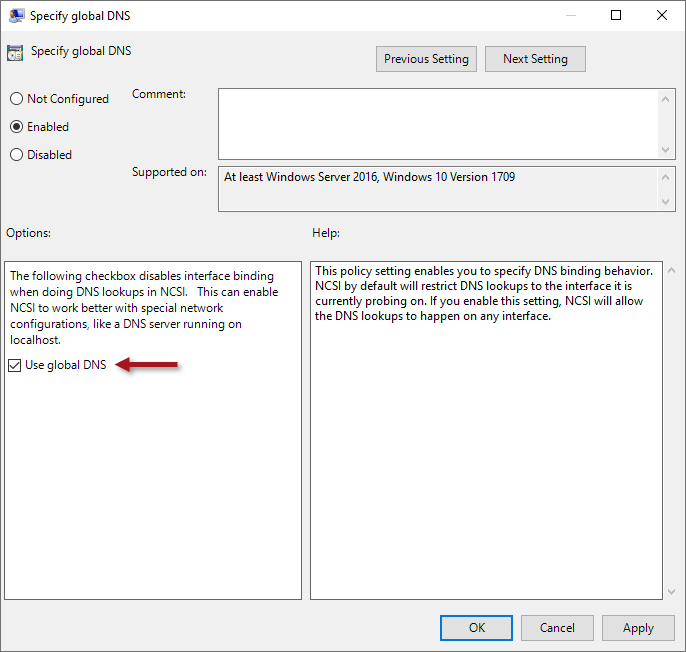 You can enable this setting via Active Directory group policy by navigating to Computer Configuration > Administrative Templates > Network > Network Connectivity Status Indicator > Specify global DNS. Select Enabled and check the option to Use global DNS, as shown here. For testing purposes this setting can be enabled individual using the following PowerShell command. As Always On VPN connectivity can be affected by NCSI, any third-party firewall or antivirus/antimalware solution could potentially introduce VPN connection instability. Observe NCSI operation closely when troubleshooting unreliable connections with Always On VPN. Recently I wrote about an issue with DirectAccess servers exhibiting high SQL Server CPU usage. In that article I demonstrated a way to resolve the issue by adding a crucial index to a table in the remote access inbox accounting database. The process was a bit involved and required downloading third-party tools to make configuration changes on the DirectAccess server. Going forward, making these changes will now be much easier. Microsoft has published guidance for optimizing the remote access inbox accounting database using PowerShell. They’ve also provided scripts to back up the database and to confirm that optimization has been implemented. For more information and to download the remote access inbox accounting database optimization PowerShell scripts, click here. If you’ve ever tried configuring DirectAccess to use One-Time Password (OTP) authentication, you’ve no doubt discovered that the native Microsoft Remote Access Management console would return the following error when trying to detect and locate Certificate Authority (CA) servers. The workaround for this issue required dropping to the command line and executing PowerShell commands to complete this configuration as I outlined here. Thankfully Microsoft has made available a hotfix to address this issue, returning full GUI functionality for configuring DirectAccess and OTP authentication. For additional details about this hotfix and to request the update itself, click here. The April 2015 monthly security update release from Microsoft includes a fix for a serious vulnerability in HTTP.sys. On an unpatched server, an attacker who sends a specially crafted HTTP request will be able to execute code remotely in the context of the local system account. DirectAccess leverages HTTP.sys for the IP-HTTPS IPv6 transition protocol and is critically exposed. Organizations who have deployed DirectAccess are urged to update their systems immediately. More information can be found on MS15-034 here. Last year I wrote about Microsoft hotfix KB2953212 that that allowed users to disable the Name Resolution Policy Table (NRPT) on a DirectAccess client. This hotfix addressed a specific scenario where a DirectAccess client on the internal corporate network could not connect to local resources due to Network Location Server (NLS) unreachability. This occurs because the KB2953212 hotfix was included in KB3000850, the November 2014 update rollup for Windows 8.1 and Windows Server 2012 R2. You can verify this by opening the Control Panel and selecting Programs and then clicking View installed updates under Programs and Features. 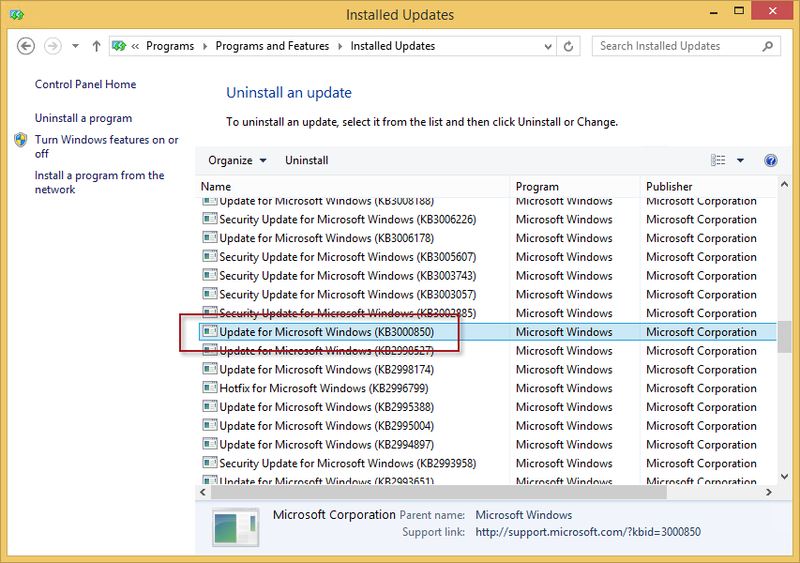 If you have the November 2014 update rollup installed there is no need to install KB2953212, as that hotfix is already included in the rollup. 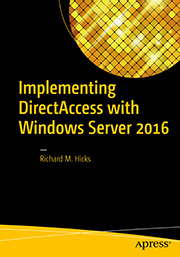 Looking for more information on Windows 10 and DirectAccess? Click here! Microsoft recently announced the availability of build 9926 of Windows 10 Technical Preview. This new update includes changes to the user interface that make it easier to view DirectAccess connection status and properties. In this latest build, using the Window Key + I keystroke combination now brings up the Settings menu. To view the DirectAccess connection status, click Network & Internet and then click Show available connections. Here you’ll find status information for all network connections including DirectAccess. 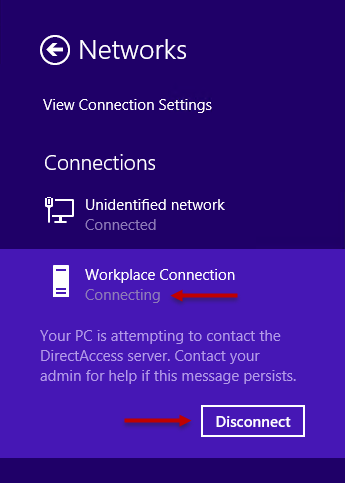 Right-clicking the Workplace Connection will allow the user to disconnect their session, if that option is enabled on the DirectAccess server. Selecting the DirectAccess submenu reveals detailed information about DirectAccess connectivity, including current entry point connection and optional entry point selection, if manual entry point selection is enabled on the DirectAccess server. Updated April 9, 2015: The hotfix referred to in this article is now included in the November 2014 update rollup for Windows 8.1 and Windows Server 2012 R2. You will receive an error message when installing this update on Windows 8.x clients with the update rollup installed. More details here. The Network Location Server (NLS) is a critical infrastructure component for DirectAccess deployments. The NLS is used by DirectAccess clients to determine if the client is located inside or outside of the corporate network. If the NLS becomes unavailable, DirectAccess clients that are already outside the corporate network are unaffected. However, DirectAccess clients that are inside the corporate network will mistakenly believe that they are outside and the Name Resolution Policy Table (NRPT) will be enabled, forcing name resolution requests for hosts in the internal namespace to be sent to the DNS64 service running on the DirectAccess server. If the DirectAccess server is unreachable from the internal network (a common scenario for a variety of reasons), DirectAccess clients inside the corporate network will be unable to connect to any local network resources by name until the NLS is once again reachable. Configuring the Network Connectivity Assistant to Allow DirectAccess clients to use local name resolution does not resolve this issue. Although it sounds intuitive, it doesn’t resolve this specific issue where the NLS is unreachable. 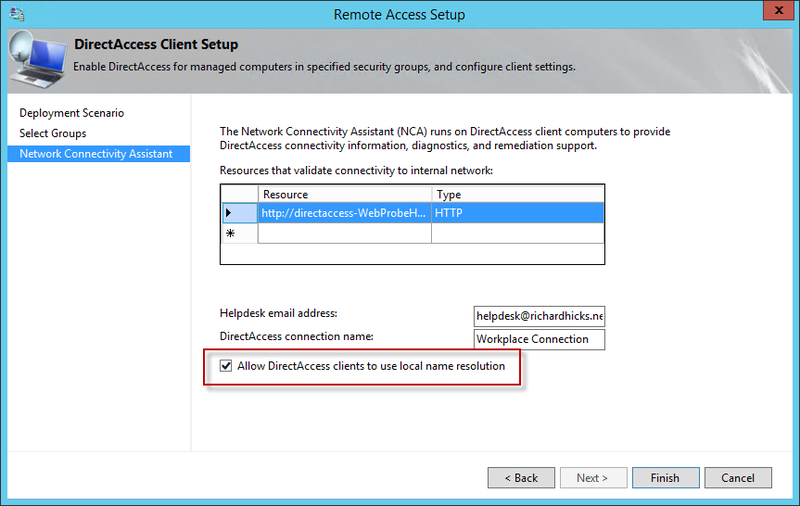 When the option to Allow DirectAccess clients to use local name resolution is enabled, the client can only choose to disconnect (use local name resolution) after it has successfully established a connection to the DirectAccess server. If the DirectAccess connection shows that it is still connecting, the option to disconnect is not available. To address this issue, Microsoft has released update KB2953212 for Windows 8.x clients that allows the disabling of the NRPT regardless if the client has successfully established a DirectAccess connection. 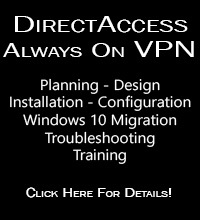 With this update, if a DirectAccess client is located on the corporate network and is unable to reach the NLS, the user will be able to disable the NRPT (effectively disconnect DirectAccess) and once again connect to resources on the corporate network. This update is certainly no excuse not to deploy your NLS in a highly-available configuration using Windows Network Load Balancing (NLB) or a third-party external load balancer (hardware or software), but it can be a life-saver if your NLS becomes unavailable for any reason. I’d recommend deploying this update to all of your Windows 8.x DirectAccess clients soon. For more information and to download the hotfix, click here. Microsoft recently published knowledge base article KB2928193, announcing the availability of a Routing and Remote Access Service (RRAS) rules update for the Best Practices Analyzer (BPA) in Windows Server 2012 R2. 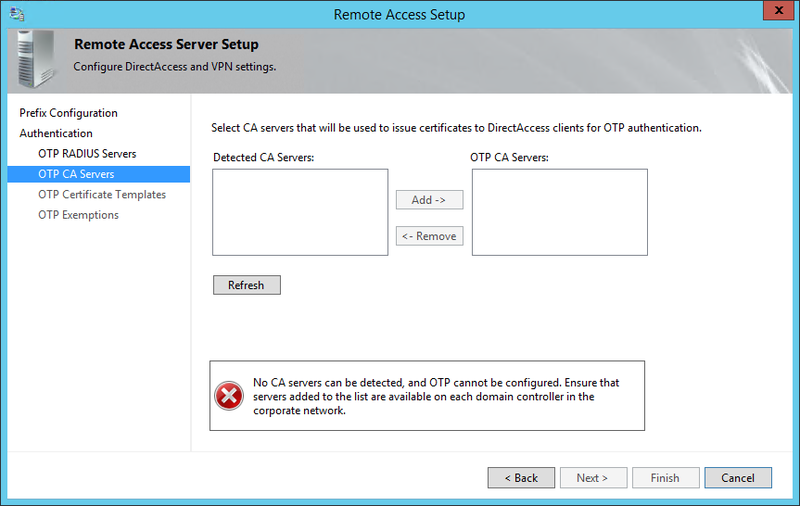 If you are using Windows Server 2012 R2 for client-based remote access VPN or site-to-site VPN, you are encouraged to install this update prior to executing a BPA scan. You can download the update here.